In another of my expeditions into the wilder reaches of Christianity I came across a Scottish organisation called Light and Life who you can find on the internet here: www.lightlife.org.uk. 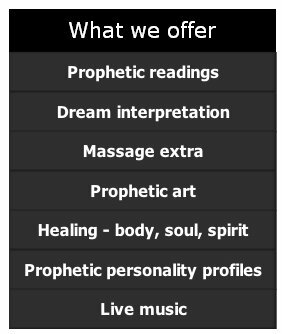 This will be a great stress-busting evening with FREE: live music, dream interpretation, spiritual readings, head, shoulder & hand massage; prophetic art and healing prayer. We will also have stalls selling jewellery, arts, crafts & other similar merchandise. 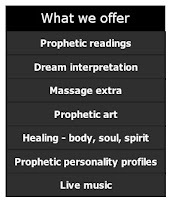 It really does sound like a psychic or new age fair. Its hard to see what any of this has to do with Christianity. The image above is a screen capture from their web site and yes, it actually does say "massage extra". Presumably they have led much more sheltered lives than I have or they might have chosen better phrasing. Light and Life has quite a few volunteers and an advisory board which has members from Healing Rooms, CLAN, Pray for Scotland and YWAM. After a bit of further digging around I found that they share a number of people in common with Glasgow Prophetic Centre which runs prophetic mentoring schools and is itself is closely associated with Sharon Stone and Glasgow Elim (a church which promoted the Lakeland Revival and which is closely associated with the Toronto Blessing). Their intention is to expand Light and Life to every town in Scotland, so its coming to a town near you soon, presumably.